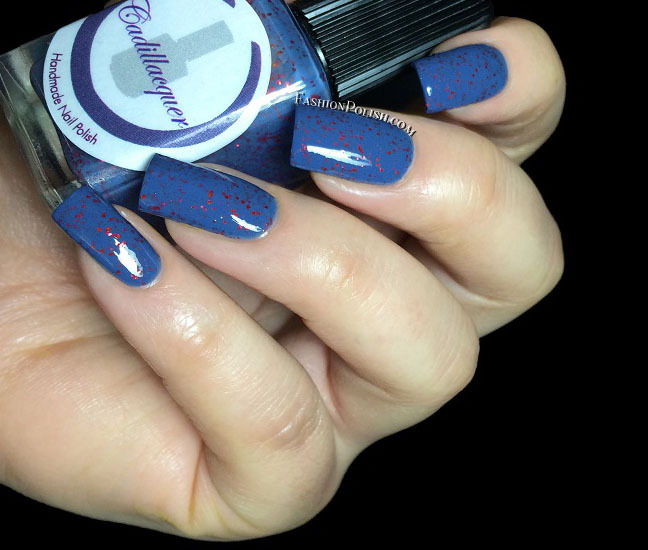 Fashion Polish: Cadillacquer Seek The Fire collection review! Cadillacquer Seek The Fire collection review! The Seek the Fire collection is inspired by the video game "The Last of Us", which I know absolutely nothing about (don't judge! haha) but that doesn't prevent me from enjoying the polishes, right? Beyond The Walls is a subtle light taupe scattered holo infused with a blue shimmer as well as small sparkles in blue, green and pink. I love how different it looks from your average taupe, so unique! Nice and easy to work with, I used 2 coats for complete coverage. 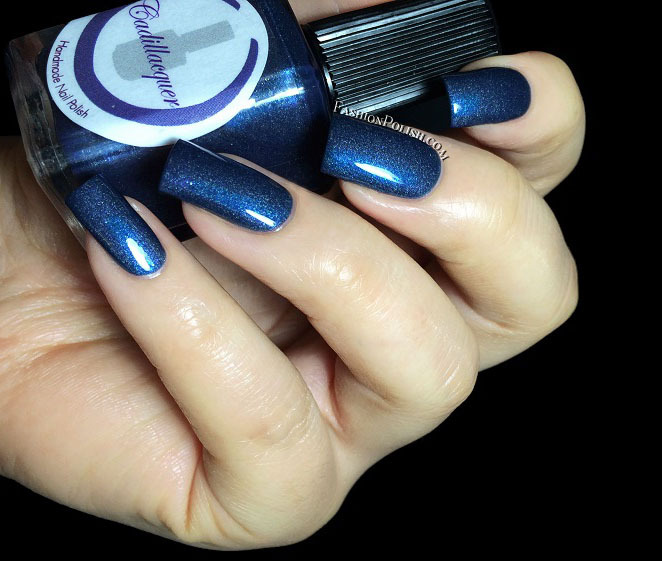 By Night is a dark blue scattered holo with blue and green shimmer flecks. It has a lot of depth and a flawless application. Coats used : 2. Not Alone is a blackened teal jelly with copper shimmer and a mix of gold, copper and green hex glitters. Super vampy, complex, just plain gorgeous! I used 3 thin coats in my swatches below for macro purposes but I could have gotten away with just 2 otherwise. Seek The Fire is a medium blue crelly packed with small metallic red hex glitters. It's an unusual color combo but I really love it, there's just something about the bold red against the dusty blue that appeals to me. This one was perfect in 2 coat as well. She's One Of A Kind is a very pale blue base grey infused with a bright red/pink shimmer but also a subtle touch of scattered holo. I don't usually love light pastels that much but this one looks so pretty and delicate! Another 2 coats used below. State Of Emergency is a black base with a very strong red/copper shimmer and exra scattered holo particles. It reminds me a little bit of AEngland Briarwood from the Burne Jones Dream collection but it's much darker. Typically a "me" color, stunning and perfect in 2 coats. Survivor is a dark purple crelly packed with periwinkle hex glitters. I didn't knwo what to expect on the nails but the color combination works really well! Surprisingly pigmented, it was fully opaque in 2 coats. 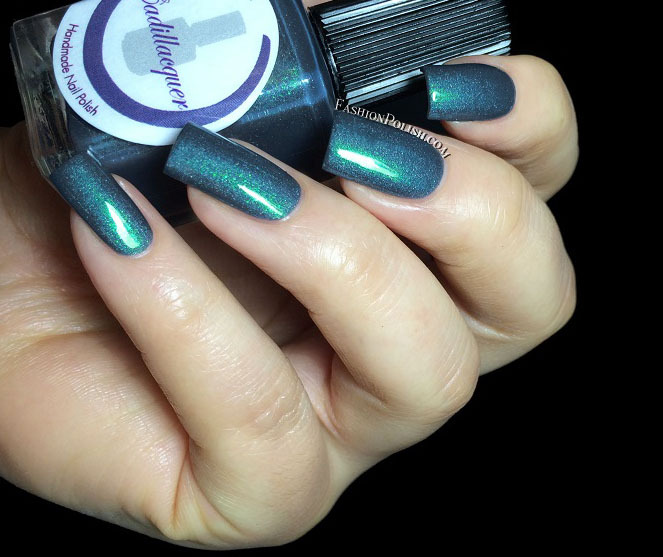 The Journey is a dark grey/blue base with a strong green shimmer/sparkles combination and a soft scattered holo. It's definitely one of the gems in this collection, so so gorgeous! And... Yet another perfect 2 coater. The Woods is a bright green base with a soft holo and gold shimmer / green and icy blue sparkles. A beautiful shade of green and, again, so deep and unique. You're looking at 2 coats here. I can't express how much I love Cadillacquer in general but also this collection in particular! Everything about it is subtle and perfectly well balanced. I don't think I could pick a favorite, the more I look at them and the more I love them all! So what about you? Anything you see you like? Have you ever tried Cadillacquer?